As a work named after the angel of death, Joseph Suk's Asrael cannot really be expected to make for comfortable listening. Originally conceived after the death of Dvořák, Suk's father-in-law, the already tragic tone of the piece was compounded and intensified by the subsequent death of his wife, Otylka. As Jan Smaczny's brief liner-note tells us, Suk then altered his plan for his final two movements, scrapping a fourth that he was already working on and the idea of a variation form finale in favour of two Adagios. The original plan to contain a finale within a somewhat stricter formal framework was, one might say, discarded in favour of a looser design, better suited to the subjective style he now felt was necessary. What we are left with, then, is an hour-long Symphony for large orchestra in C minor with a third movement Scherzo (marked vivace) sandwiched between the first two movements (both Andante sostenuto) and two final Adagios. Much of the work employs a musical language that is rather muted in expression and limited in its melodic variety yet the cumulative effect is undeniably powerful. Smaczny draws parallels with Shostakovich, Mahler and Bruckner. There is certainly a feeling of hopelessness in some of the work's darker moments, and a sense of numb grief that looks forward to Shostakovich but, despite similarities in terms of length, Asrael lacks the clear formal or harmonic signposts that Mahler or Bruckner set out to keep their listeners on track. One senses, however, that part of Suk's strategy is to keep us guessing as to where we're headed and as such the final four minutes or so of the last movement are deeply affecting, a gently moving apotheosis of sorts that gives yet more evidence of Suk's enormous technical skill. The final coda definitely suggests a programmatic element that might or might not throw light on the rest of the work; it's not something that Smaczny mentions. The opening movement is perhaps the most grimly resigned, employing an almost ascetic palette of colours to evoke a largely hopeless sense of mourning. The texture is occasionally punctuated by some more violent ideas and there's some respite in lyricism and some dance-like episodes. The second largely exists in the same emotional world, alternating a sighing string idea with an implacable brass theme, which is developed but stops short of the emotional anger one half expects. The flighty Scherzo perhaps shows most the slight limitations of Suk's musical language: the outer sections can sound a little directionless; the lyrical central section, however, provides a rare moment of emotional warmth. The final two Adagios return us to the bleakness of the opening movement yet the second provides a wider variety of moods, much of it is at a much faster sounding tempo than Adagio, including snippets of a demonic Totentanz on the clarinet. The unexpected and extremely beautiful coda ends in uncertainty yet with a hint of reconciliation, the final bars bizarrely reminiscent of the end of Strauss's Also sprach Zarathustra. If Suk's voice is not especially revolutionary, it has a flavour all its own and he can be greatly admired for using the large forces at his disposal with a seriousness of purpose, patience and integrity that is very much in keeping with the grim subject matter. Vladimir Ashkenazy is equally to be admired for a performance that seems ideally in tune with the idiom, even if he's at times considerably more relaxed than Vaclàv Neumann on his 1983 Supraphon recording. Neumann's Czech Philharmonic Orchestra also has a more interesting and characterful sound than The Helsinki Philharmonic, yet the Finns' playing is unostentatiously polished and refined. The engineering from Ondine is of demonstration quality; although recorded 'live' there's no audible sign of an audience being present. Suk has had various champions over the years including, inevitably, Sir Charles Mackerras who released an outstanding recording of A Summer's Tale on Decca with the Czech Philharmonic some years ago. 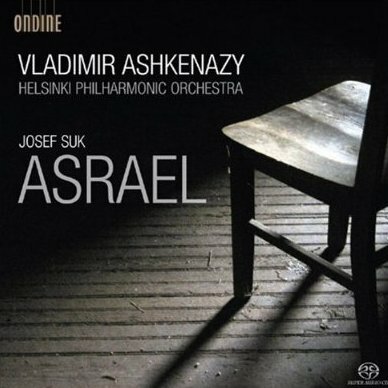 Ashkenazy's considered Asrael, then, adds another important release to a somewhat paltry catalogue of recordings of works by an important and masterly composer.